Most brides-to-be spend hundreds, if not thousands of dollars on the wedding gown of their dreams. Chi Krneta whipped one hers for almost nothing. For five months, Seattle architect spent her 50-minute daily bus commute crocheting an entire floor-length dress from two bargain-priced skeins of white cotton thread—Aunt Lydia's, if you want to get specific. Only the material she used to line it cost more than a few bucks. "The dress was practically free because I didn't spend much money on it (under $30 for all of the materials including fabric for the lining) and I didn't spend much extra time on it," she posted on Reddit on Thursday. My commute time couldn't be used for anything else anyway." Krnetagot, who said she just “winged” the pattern, learned to crochet as a child from her late grandmother. 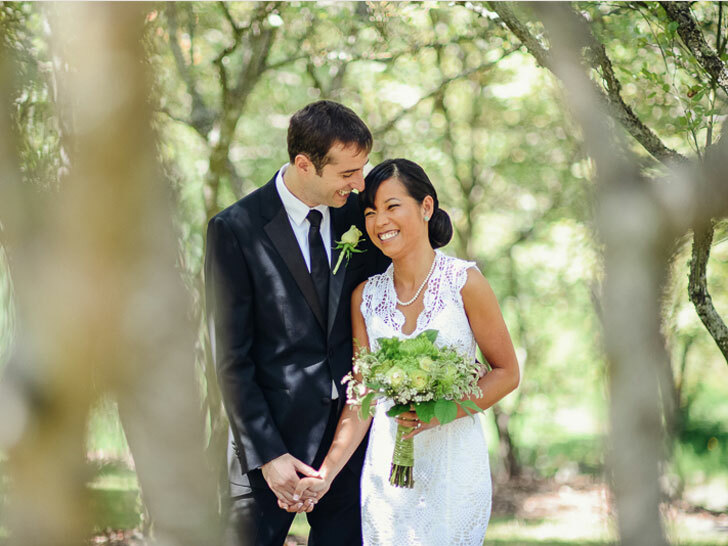 Crocheting her dress was a “nice way of incorporating [her] grandmother’s gift” into her July 26 nuptials, she added. But Krneta also designed her gown to be wearable after the wedding. Unlike its more-delicate ilk, the dress doesn’t require special care. It’s even machine-washable. “I plan on wearing it again with linings of different colors and with the train bustled up in different ways,” Krnetagot said. Now that the wedding has taken place, Chi should consider dyeing it so it has a life beyond her big day! Krnetagot, who said she just "winged" the pattern, learned to crochet as a child from her late grandmother. Crocheting her dress was a "nice way of incorporating [her] grandmother's gift" into her July 26 nuptials, she added. But Krneta also designed her gown to be wearable after the wedding. Unlike its more-delicate ilk, the dress doesn't require special care. "I plan on wearing it again with linings of different colors and with the train bustled up in different ways," Krnetagot said.